Over the last couple of weeks I facilitated two women’s circles on the topic of “Heal Your Heart”. In total, 26 women attended. That’s a big number in my world. I’ve been offering these circles on different topics every month for the last few years and the biggest group I’ve ever had is 15. It makes me wonder what it was about this topic of Heal Your Heart that made it so popular right now. There seems to be a real longing to have a safe space to talk about grief and to create some hope that there are strategies and ways forward from the pain associated with emotional loss. One of the biggest take-aways from those who attended was the scope of the type of losses that result in grief. Death and divorce are the most obvious but during the brainstorm discussion, other types of losses identified were; moving, job change, kids moving away, loss of health, change in friendship, getting older, loss of identity, pet loss, and many others. So as you can see, if you include all those as losses, even if no one close to you has died, chances are you’ve experienced grief in your life…and it accumulates. What aligned with these sessions was a blog Brene Brown wrote titled “The Midlife Unraveling”. It’s an unexpected awakening when the tricks we’ve been using to avoid the hurt are no longer effective. It feels unfair that we actually have to do something to heal the hurt and that it doesn’t just naturally heal itself with time. 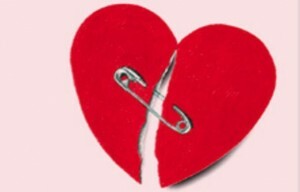 Maybe that’s why this topic for my women’s circle was so popular; Healing Your Heart is a necessary task of mid-life. I know focusing on grief recovery is not the most motivating place to invest your time, energy and money. It would be so much more familiar and desirable to just keep doing what you’re doing. But for those of you who feel the unraveling, know heart healing is something you’re being called to do, and don’t want to do it alone, The Grief Recovery Method is the best way I know to begin the healing process. As a Certified Grief Recovery Specialist, I guide people through a structured, educational program that provides the correct actions steps to help them move beyond the pain caused by emotional loss. I also know that focusing on yourself and your own healing is not a selfish endeavor. Now, more than ever, the world needs as many healed, healthy people as possible to support others who may not have privileged access to supportive resources. This video I did last week looks at an amazing cottonwood tree and living with its grief. If you have any comments or questions, feel free to comment here or contact me.